Fat Quarter Shop's Jolly Jabber: 12 Gifts of Christmas Blog Hop<-- Yup, that means Giveaways! 12 Gifts of Christmas Blog Hop<-- Yup, that means Giveaways! 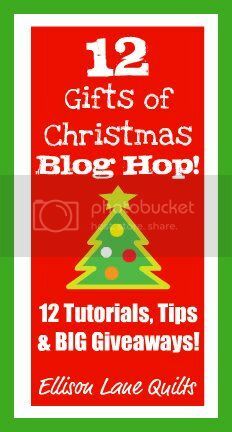 The 12 Gifts of Christmas Blog Hop is an awesome 12 stop tour of super gift tutorials and tips just in time for the holidays. You’ll have ideas for everyone and plenty of time to get started on your handcrafted holiday gifts. From October 14-October 25th, 12 talented, modern sewing bloggers are bringing you simple, stylish, and useful gift tutorials for everyone on your list. There are also 12 fabulous prizes, including 8 from the Fat Quarter Shop! The fun starts at Ellison Lane Quilts on October 14th so be sure to stop by!